T hough English in origin, “Mary, Mary quite contrary, how does your garden grow?” is a familiar refrain to most New Yorkers. And this season, diners can pose that same question to some of their favorite chefs, who have yearned to go beyond the greenmarket and have established their own gardens where they get their hands dirty, nurturing the soil and raising vegetables and herbs to share with their guests. 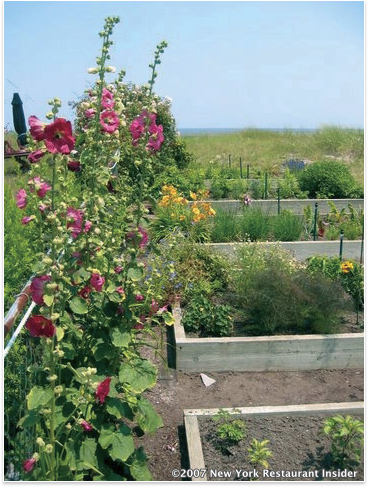 Chefs Ben Pollinger of Oceana, Michael Psilakis of Anthos, and Michel Nischan of The Dressing Room have been avid gardeners since they were children, well before they knew they wanted to be chefs. 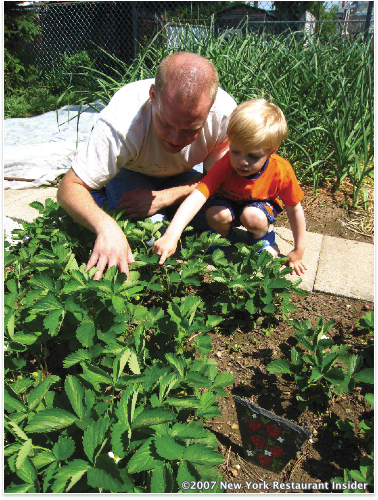 Pollinger has a 500 square foot garden in his home’s backyard, with 50% dedicated to vegetables and the rest for herbs and a strawberry patch with a fig tree. “I’ve been gardening as long as I can remember,” Pollinger says. “My grandfather and father were gardeners as well, and my grandfather used to spend a lot of time with me in the garden.” Nischan’s 9000 square foot garden is the result of a lifetime of gardening which began when his mother tore up his suburban Chicago backyard and turned it into a garden where she grew vegetables for canning and pickling.